Daboia russelii is a species of venomous snake. The head is flattened, triangular, and distinct from the neck. The snout is blunt, rounded, and raised. The body is stout, the cross-section of which is rounded to circular. The color pattern consists of a deep yellow, tan, or brown ground color, with three series of dark brown spots that run the length of the body. Each of these spots has a black ring around it, the outer border of which is intensified with a rim of white or yellow. Housing for Daboia russelii is pretty simple. Neonates can be kept in shoe box size drawers 0.3 x 0.2 x 0.1 meters (1 x 0.65 x 0.33 feet). Adults should be housed in large enclosures, 1.8 x 0.8 x 0.5 meters (5.9 x 2.6 x 1.6 feet). They have a long reach when biting so you need large enclosures to avoid them from getting you and also with sliding door enclosures is easier to know where the snake is before you open the enclosure. You can decorate the enclosures with logs and plants (fake or real) to provide a naturalistic approach and more cover to your snake. If you are housing your Daboia russelii in big enclosures, you should place minimum a hide at each side of the enclosure along with the logs and plants. You can use variety of substrates, aspen or cork bark are good options. 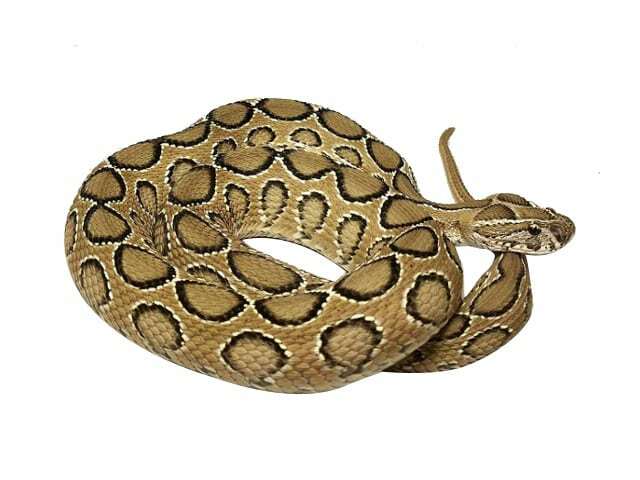 Make sure that the substrate is deep enough in order for the snake to burrow half of its body. It is recommended to provide a natural light pattern that mimics normal daytime with 14 hours on/ off during summer and 8 hours on/off during winter. My room is usually at 24-27 °C (75-80 °F). I have a heat tape across the back of the cages which is set at 32 °C (90 °F). I cool down my adults from 1st of December until 1st of March with temp drop down to 16 °C (60 °F) at night and heating them up to 24-27 °C (75-80 °F) for 8 to 10 hours during the day. I keep a water bowl with clean water available at all times. These animals do best in a dry climate i keep my animals anywhere from 20% to 50% with an average around 35%. Neonates can be fed weekly an appropriate size meal. When adult size is reached I feed them bi weekly unless I am getting females ready for breeding. I stop feeding my adults two weeks prior to cooling. Daboia russelii are a pretty aggressive animal that doesn’t like being handled . Extreme care should be taken using the proper handling equipment. Spot cleaning whenever necessary and total tub cleaning weekly. I move my snakes into a large garbage can with a lid to clean cages. Under the proper conditions, shedding for this species will go fine. They rarely ever have shedding issues if the humidity of the enclosure is at proper levels. No specific potential health problems to mention for this species beyond those affecting reptiles and/or snakes in general. The one thing that I would like to point out is to not overfeed them because this can impact their health and their lifespan. They seem to be a relatively hardy animal when kept properly.